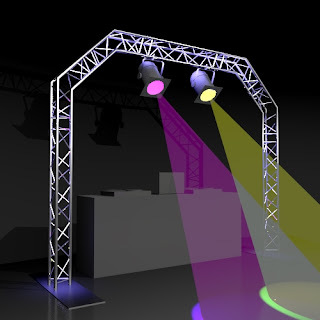 Why Aluminum Truss for DJs? A survey of DJs will tell you that aluminum truss is a great option for mobile lighting and sound systems, namely because of its portability and speed. Check out our lighting truss for DJs and you’ll see why it is one of the most popular systems for DJs on the go. DJs don’t have time to erect elaborate sound booths at parties and events. QuickTruss offers lightning fast speed when setting up a DJ truss booth – about 5 seconds per connection. And tool-free assembly means you don’t need to lug a tool box to the venue to get the job done. We do recommend a hard plastic mallet to get tapered pins in and out of place. The light physical weight of QuickTruss aluminum truss makes it easy to handle and set-up. A 6.5’ length of M290B Trio (triangular) truss is only 28lbs, so bringing your lighting truss in and out of the event isn’t a big feat requiring a crew of handlers. Aluminum truss is more than a decorative addition to your DJ truss booth. A 13' span of triangular M290B QuickTruss can handle more than 2,200lbs (distributed). Hang lighting, speakers, monitors, a disco ball, even a big cage of live turkeys. We’re not judging. It’s simple to add or remove pieces to your truss booth as needed due to venue size, equipment needs, or just to change things up. Using shorter lengths of truss allows for more flexibility. Affording aluminum truss is easier than ever. We offer QuickTruss DJ Booth Kits at a great discount off regular list price. We are also offering an additional 5% discount for orders placed this month using a coupon code at checkout. Aluminum lighting truss is so durable, you’ll be enjoying your investment for many years to come. View all of our DJ Truss Kits at www.DisplaysExhibits.com. Don’t see what you need? Contact us to design something specific to your needs – we offer free AutoCAD designs to bring your dreams to reality. All truss kits are in stock today in natural silver finish or can be powder coated (allow additional time for powder coated truss).